Paris : Jean Marchant for Jean Petit, Mar. 22, 1508. 174 leaves : 1 ill.
Device of Jean Marchant (Davies 73) on last leaf verso. Device of Jean Petit (Renouard 883) on t.p. Woodcut on verso to t.p. is the scholar resting on one elbow seated at a desk--(Cf. the Pierre Le Dru cut in Murray cat. of Fr. Bks. II, p. 728). Old stiff calf over boards in brown case. 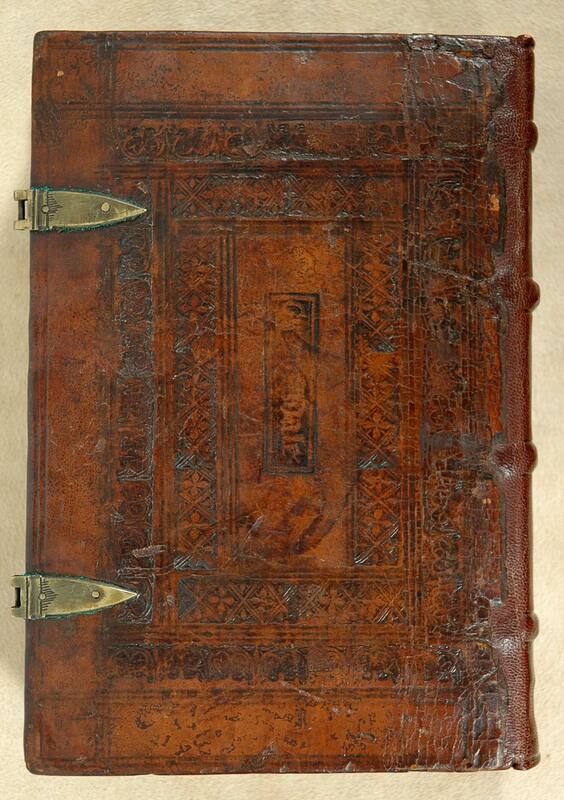 Dark brown stamped calf over wooden boards; 2 metal clasps missing; signed binding from the Augustinian monastery of Groenendael or Gruenendale, near Brussels--See Goldschmidt, p. 11 and no. 87 in his collection. Also plate C7. Written on t.p. : Liber monasterij Viridisvallis in Zonia Ordinis Canonicoru & Augustini epj. (i.e. the Augustinian Priory of Groenendael, or Gruenendale, diocese of Cambria, near Brussels).